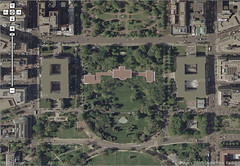 The latest example of cool emergent technology is Google Maps rendered with satellite imagery annotated with Flickr notes. Geeks and the geekly inclined are zooming in on neighborhoods where they once lived and are tagging those screen capture images with notes describing historical moments in the geography. Flickr has a group called Memory Maps dedicated to this. Since I grew up in the DC area, I decided to look around some internationally known locations to see what they look like from the sky. Interesting to note that the White House and the neighboring Old Executive Office Building and Department of Treasury buildings are “sanitized” from the top, for national security reasons I’m sure. Their roofs are represented as blank continuous dull colors with none of the detail you’ll find on other buildings. Some areas, such as the courtyards in the Old Executive, are grossly pixelated. On the other hand, the Pentagon, looks complete with detail. This begs the question, what does it take to get a piece of property obscured from Google’s database? Can I fill out a form and demand that my house be gzapped so no one knows that the grass hasn’t been cut in 3 years or that my meth lab exploded? As if that wasn’t enough cool, this brilliant individual figured out how to remix Craig’s List housing ads with Google Maps. This is the kind of thing that some bubbleheaded VC would have sunk $30 million into 5 years ago. And now it’s done emergent style with an idea and a little duct tape. Imagine what can happen when there is an open API for all this.